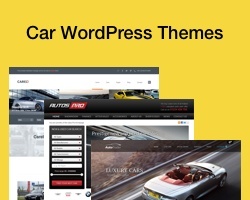 This is a collection of the best automotive and car WordPress themes for car dealerships, auto traders, car rental businesses, car bloggers, auto marketplace websites, car review sites and others in the car and auto industry. It doesn’t matter if your selling cars, motorbikes, trucks, tractors, boats or any other type of vehicle you will find a great WordPress theme for your website below. The Auto Sales WordPress theme is a professional auto and car dealership WordPress theme solution from Gorilla Themes. The premium theme allows you to easily build a care dealer and auto classifieds website using WordPress. It has a lot of handy functionality such as: VIN number decoder, inventory management (price, make-model, VIN number, vehicle photo and more information), vehicle information module (with customizable fields (for condition, price, mileage, year, exterior color, interior color, vehicle type and much more), detailed search and sort functionality, sell your car form uploader with a pay per listing module, PayPal integration, unlimited color options, mobile responsive design and much more. Auto Trader is a slick auto WordPress theme that is mobile ready with a responsive design. The premium car WordPress theme from Theme Fuse is designed specifically for online vehicle marketplace websites, car dealerships, auto motor magazine sites or car blogs. It has a light, modern and professional design and all the features and functionality you need in an auto and car showcase website. Features include: a custom homepage design with large featured slider, and advanced search module with filtering functionality, custom vehicle page template to showcase cars, impressive mega menu system, custom page templates and shortcodes, powerful admin options and more. Pitstop is a car repair shop WordPress theme from 7Theme. The premium theme has been designed specifically for auto repair shops, garages, mechanics, auto detailers, spray painters, handymen and any business in the automotive industry. The theme has a professional and customizable design that is mobile friendly. It allows you to display your services, portfolio, testimonials, team, clients / partners, and other business information. Some of the other key features of the theme include: extensive control and customization options, 100+ shortcodes, parallax effects, SEO optimized HTML5 code, WooCommerce ready, drag and drop slider, unlimited sidebars, unlimited colors and backgrounds, Google fonts, contact form, custom logo upload and much more. AutoMax is an automotive WordPress theme solution designed for auto dealers and vehicle classifieds websites. The premium theme from Gorilla Themes has a mobile friendly responsive layout and a lot of powerful features built into it. It includes a Pay Per Listings module for selling classified ads where visitors can submit their used car listings and you can charge a fee for listing their vehicles on the site. Some of the other key features include: batch XML and CSV importing of vehicle listings, Craigslist integration, VIN Decoder (place the vehicle VIN in the listing administration and with a click of a button all information available about that particular vehicle will be automatically pre-filled in the listing page – American market only), PayPal integration, template with full vehicle information and specifications, photo galleries and YouTube and Vimeo for video, customizable currency and metrics, custom widgets, finance calculator, used car form uploader, 5 colour schemes and more. The responsive car dealer WordPress theme from Premium Press is designed for online auto trader and car dealer websites. The premium theme is search engine friendly and feature packed making it ideal for car, dealers, vehicle collectors and vehicle classifieds websites. Some of the top features of the theme include: Geo location and maps, advanced search functionality, built in make and model options, users can list their vehicles, members area and management tools, membership and ad packages, media upload support (images, video, music, PDF, doc etc), drag and drop homepage layouts, easy text and colour change options, and much more. 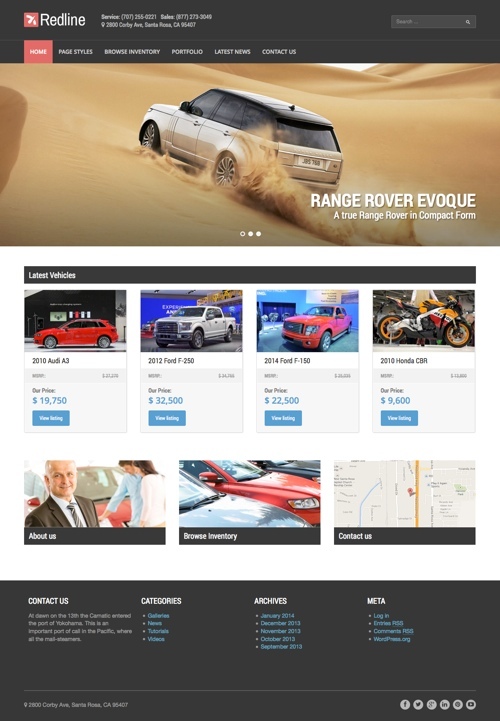 Dealership is a mobile responsive car WordPress theme for dealers from Gorilla Themes. The premium theme great custom vehicle specific functionality built-in and is ideal for any type of dealership selling new and/or second hand cars, motorbikes, trucks, or other vehicles. It allows you to showcase your inventory of vehicles and display photos and list all relevant information. Some of the key features include: a VIN decoder (which automatically fills in the vehicle information fields when you enter the vehicles VIN number), custom fields for full vehicle specification and information (car condition, year, miles, exterior-interior colour, vehicle type etc), photo gallery and video support, ability to add your own labels and options to the advanced search module, a used car form uploader so customers can submit their vehicles for appraisal and sale on the site, XML & CSV importer, 5 colour styles, Craigslist integration, language localisation and currency and metric options, logo uploader, finance calculator and more. 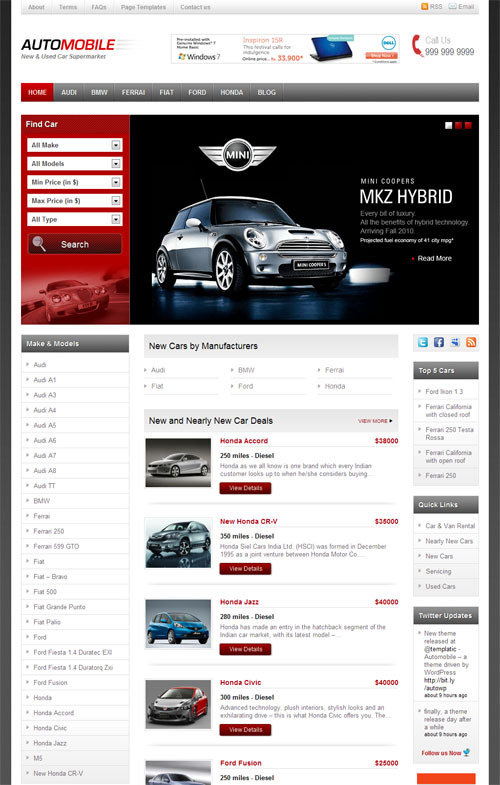 Redline is a fully featured and easy to customize WordPress theme for car dealership websites. The theme supports the Pro Car Dealership WordPress plugin for advanced functionality such as: vehicle inventory, custom search fields, vehicle specifications, and more. Some of the other the theme include: a mobile responsive layout, unlimited colour scheme options, translation support for any language, unlimited sidebars, and more. Automotive is a featured packed niche application WordPress theme specifically built for car dealership websites. The premium theme from Gorilla Themes is mobile friendly with a responsive design and is ideal for new car dealerships as well as second hand car dealers to showcase their vehicles for sale. The Automotive theme has some great custom vehicle specific functionality built-in. It has a VIN decoder which automatically fills in the vehicle information fields when you enter the vehicles VIN number. It has custom fields for full vehicle specification and information (car condition, year, miles, exterior-interior colour, vehicle type etc), photo gallery and video support, ability to add your own labels and options to the advanced search module, and a used car form uploader so customers can submit their vehicles for appraisal and sale on the site. The theme is widget based so you can structure the layout and design of the site to suit your needs. Some of the other features include: XML & CSV importer, 5 colour styles, Craigslist integration, language localisation and currency and metric options, logo uploader, finance calculator and more. 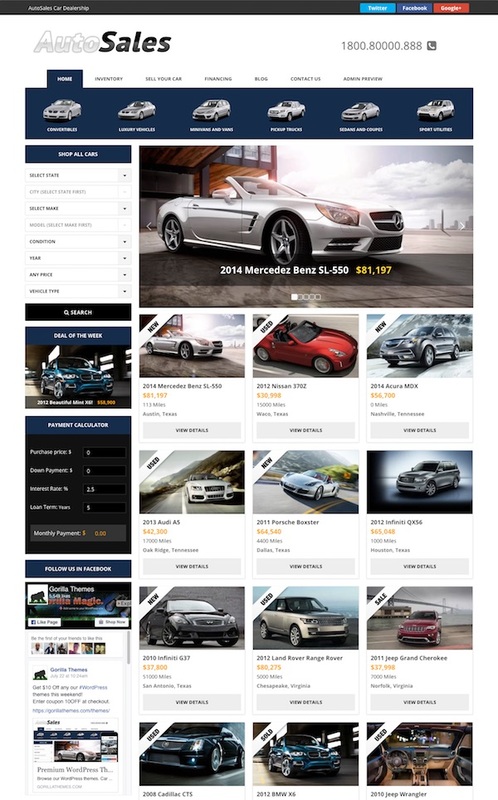 Auto Dealer is a professional car dealer and car marketplace WordPress theme. The powerful and customisable premium theme has been specifically developed for car sellers, car dealers, auto dealers or vehicle marketplaces. Some of the key features of the theme include: front end submission system and payment package options powered by WooCommerce, 1 click automatic setup, built-in ajax registration system and dealer profiles, email notifications for listings, built in search system with advanced filtering, WPML plugin support for multiple languages, 100% mobile responsive design, custom post types and taxonomies for vehicles, 3 different vehicle page layouts (grid, list and map), HTML5 and CSS3 code, icon fonts, fully customisable colours and layouts, mega menu system and much more. Automotive is a car portal and vehicle directory WordPress app theme from Templatic. The premium theme can be used by car dealers to showcase new and used vehicles for sale, or as a vehicle classifieds website for selling second hand cars, motorbikes trucks etc, or it could even be used as a car information portal / directory website. Automotive is powered by Templatic’s Tevolution plugin which enables advanced functionality within the theme such as: front-end user submission to submit vehicles for sale, payment options, advanced search functionality, and custom vehicle page templates with photos, sections for vehicle data and other information. It has options to create custom post types so you can easily manage cars and other types of vehicles such as motorbikes, trucks etc. Some of the other key features include: WooCommerce and Gravity Forms integration, responsive layout, custom homepage with drag and drop widgets, unlimited colour options, automatic updates, a wide selection of shortcodes to create unique post and page layouts, 1 click dummy data install and more. Car Dealer is an advanced car dealership WordPress theme from Gorilla Themes ideal for selling new or second hand cars. The premium theme features Craigslist integration to easily copy and paste the pre-formatted code into your Craigslist account. The vehicle details pages include full vehicle specifications, photo galleries and option video. Other features include a financing calculator, customisable currency and metrics, customisable search module and more. 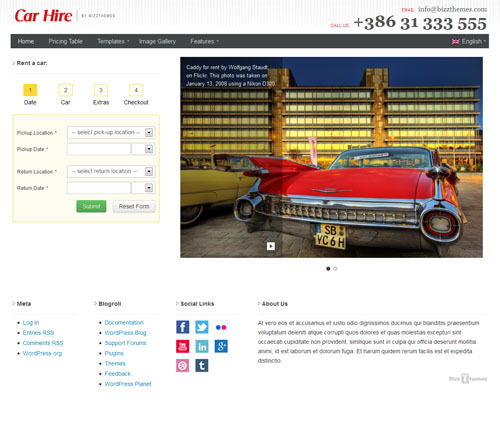 Car Hire is an advanced car rental WordPress theme complete with an integrated smart booking system. The premium theme from BizzThemes provides a complete solution for building a small to medium sized car rental business website with WordPress. It gives you the ability to take and manage car reservations directly on your website with just a few clicks. It has car fleet management options to group different car types and manage rental pricing effectively. The smart calculation engine allows you to set different prices according to car type and days, options for car specific extras, and automatically manage car booking schedules. It has options to manage multiple car rental office locations and view cars by location. It has an inbuilt email notification system to automatically notify customers via email when their booking is received, confirmed or cancelled. The theme has a heap of inbuilt options to easy customise the layout, design, colours, typography etc, and has a fully responsive design so will work nicely on mobile devices. Automobile is a premium WordPress theme from Templatic designed for car websites. The theme could also be adapted to showcase other products besides vehicles. The car theme features a fully widgetized homepage allowing you to drag-and-drop sections to build the homepage to your requirements. It also includes custom car listing and details pages, extensive backend and custom field management options, CSV bulk upload facility, 4 colour schemes and more. CarPress is a car WordPress theme designed for car mechanic workshops, car repairers and detailers, vehicle service centers and other related businesses. The premium theme is built on top of SASS Twitter Bootstrap and has a retina ready, mobile responsive design. Some of the other key features of the theme include: advanced admin options and WordPress customizer support, WPML and WooCommerce plugins support, custom widgets and sidebars, custom templates for galleries, services, appointment, blog etc, Google fonts, and more. The Carell WordPress theme has a clean and modern design created for any type of car dealership business. The theme includes specific functionality for a car website. It provides full control over car details and equipment custom fields, fully customisable search fields for the search results of car listings, and you can create your own page layouts. Some of the other features of the theme include: 5 navigation styles, 6 listing layouts, 4 blog styles and 2 single layouts, customisable units of measurement (miles, kilometres etc), translation ready, unlimited colour options, advanced admin options and more. Shandora is a dual-purpose real estate and car WordPress theme for dealers. It has a bold and heavy design and is mobile friendly with a responsive layout. It has car listing functionality with custom car details page with specs and relevant icons. Other features include detailed search panel and filtering functionality, built in page builder, custom shortcodes and widgets, Google maps, and more. WP Pro Automotive is a powerful car dealership website WordPress theme built to showcase your vehicle listings. The premium theme has a clean, simple and minimalist design that is mobile friendly. While this car dealership theme was coded with vehicle sales in mind it can be used for anything from classifieds to directories. Some of the key features of the theme include: drag and drop homepage builder, unlimited skins and custom backgrounds, 5 custom page templates, powerful theme options panel, translation ready, 17 custom widgets, Google fonts, powerful custom built listing mapping, flex slider, HTML5 and CSS3 code and more. Automotive Ace is a mobile friendly car WordPress theme with a sophisticated and professional design. The theme has a lots of great options and is designed to fit any type of vehicle dealership selling new or second hand cars. Some of the key features of the theme include: all possible care specific custom fields for specifications etc, various homepage options, boxed or wide layouts, AJAX search, many colour scheme options, custom backgrounds, sticky header and footers, transition and animation effects, lots of shortcodes, responsive design, Google fonts, translation options and much more. 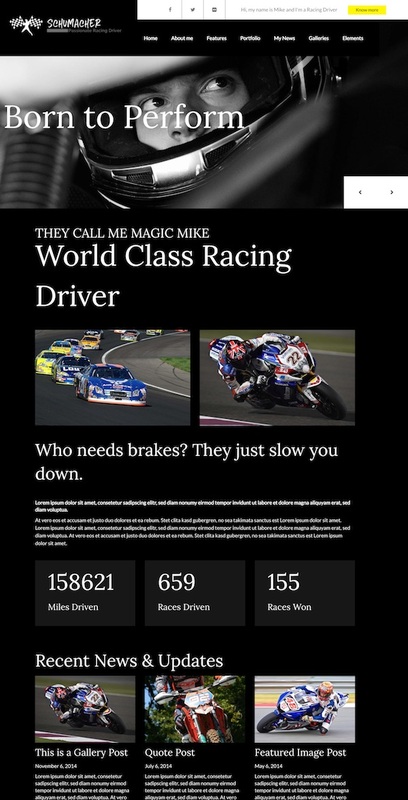 Schumacher is a racing driver WordPress theme ideal for racing driver and racing team websites. The premium theme from 7Theme has a flexible deign with customization options and the features you need to build a professional racing website.